Problem: Many seniors remain isolated in their homes much of the time. This leads to inactivity, poor physical fitness, social isolation and possibly poorer health outcomes, decreased quality of life and premature requirement for higher levels of care. Further, most seniors do not approach recommended levels of physical activity. Solution: Motiview is an online library of more than 1500 videos from around the world, taken from the point of view of a cyclist. 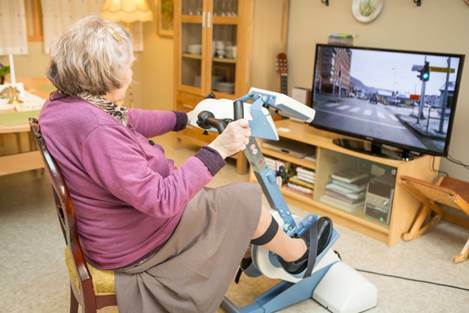 Motiview is paired with a stationary cycle and motivates seniors to “cycle” through familiar locals and exercise longer. Proposed innovations will enable on-line connectivity to allow more than one cyclist to interact while they cycle to the same video. Cycling metrics (distance, time etc.) will be saved on a server, and used to promote friendly competitions, where individuals are encouraged to work as a team to “compete” against other teams in distance travelled. Impact: We anticipate that this program will increase seniors’ physical fitness, possibly leading to other health benefits (decreased falls and hospital visits). We also expect that use of Motiview will encourage seniors to become more connected as a community, as users support each other in meeting individual and group goals.